It does not matter which position you play in fastpitch softball; you need the right glove to play at your very best. 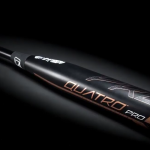 Having the best softball bat is the most important piece of offensive equipment, you should also have the best possible equipment for defense. The level of defensive play for a fastpitch softball game is based on the quality of a glove or mitt. A lot of newer fastpitch softball players struggle on the field because of a poor quality mitt. 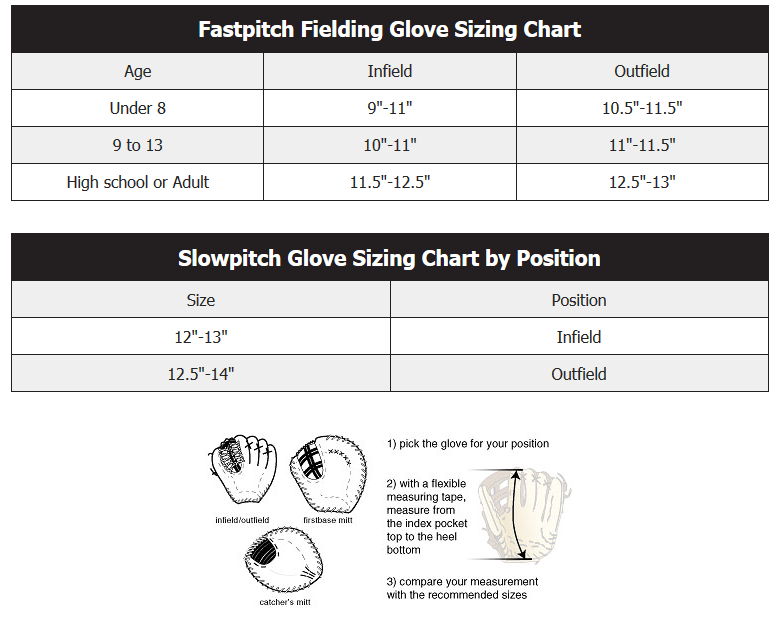 Many parents learn that the best softball glove for small hands is not based on how much it costs and should be focused on comfort. Comfort should be the first thing a fastpitch softball player thinks of when it comes to a glove or mitt. When you play games on hot days, having a glove that can keep your hand from sweating by keeping away moisture is beneficial. There are some gloves that have a softer feel to it, and some players like the feeling of the softness inside the glove vs. something more rigid leather. When you have the right size glove, it will be fitted to your hand. Different Softball Positions can call for smaller or bigger gloves and is a factor in finding the best softball glove. Players in the outfield usually have a larger glove than players in the infield. Infielders such as first base or third base players use a smaller glove. The size of a glove is important. Finding the best softball glove depends on the size of your hand and the position you play. This is a chart of the average size of a softball glove. Each measurement is not set in stone; it is just there for a reference. * Glove fits on the left hand for a right hand thrower. * Ecco Yak leather is 3x stronger than cowhide, allowing it to be skived thinner, producing a lighter glove. * Lower profile heel makes the glove more flexible, opens up the palm and pocket, and makes the glove more forgiving on bad-hop grounders. Daughter loved this glove. She 11, is small for her age (4’8″) and the glove fits well on her small hands. The pocket generously gobbles a 12″ softball and is ideal for a middle infielder. She’s used it in the outfield also and is comfortable with it at that position also. The break-in time is amazing. I had the glove broken in withing two evenings and a couple of catch sessions. I am so impressed with this softball glove that I got myself a YAK baseball glove. I always buy Rawlings heart of the hide gloves, the best gloves in my opinion. But playing softball, thought I’d save a few bucks. To my delight, this glove is expertly crafted and uses very fine leather. I am very impressed. With that said, I have fairly small hands, wear a medium batting glove. As a life long and Division I college softball player I highly recommend this glove. This glove will last years. This is the only brand I trust. High leather and design quality will ensure that this product will outlast many of the other brands. For players with smaller hands (women) the Wilson a2000 without the wrist strap will fit the hand better. The Wilson a2000 with the wrist strap will fit players with a larger hand better. The fastpitch softball glove market is filled with gloves that are overpriced, and may not be the best quality. The market is also filled with cheap gloves that have poor quality. Finding the best glove at an affordable price is possible, but you have to do some research. These gloves are competitors for the best softball glove in terms of the quality. Regardless of how much a fastpitch softball glove costs, it is an investment that you have to make. A softball glove should last longer than a season so you won’t have to get a replacement. These softball gloves have one thing in common, the longer you have them the better they get. When you are looking for the best fastpitch softball glove for small hands you are looking for longevity. The best softball glove will be worth the money and will improve a softball game over time.